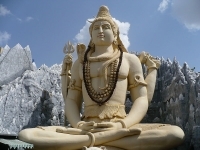 Maha Shivaratri is dedicated to Lord Shiva, celebrated in Nepal at the Pashupati Temple just outside Kathmandu. It is Nepal's biggest annual religious event, attracting an estimated one million pilgrims. For around five days before the festival, devotees from all over the world gather at Pashupatinath where they chant, meditate, fast, and tend holy fires. The passion of the devotees ensures a moving experience, as people cover their bodies in ashes and pray until falling into a trancelike state. On the eve of the celebrations, worshippers light a great fire outside the temple. It's believed that those who warm themselves at its flames will have their sins forgiven and be blessed with health and prosperity by Lord Shiva. Pilgrims pour milk on holy statues, making offerings of fruit and incense. Prayers and ceremonies take place deep into the night.